The gang’s all here! There was much excitement as Mia and Geoff arrived on the dock on Monday morning, and somehow Toucan has been able to absorb our six guests and their luggage without too much difficulty, although I think our waterline is fast disappearing! Soon after our new Toucaneers were on board, we headed into Kingstown by taxi to try once again to get local sim cards for our iphones, as well as additional provisioning. Desmond, our driver was charming and friendly (and very patient) as he ferried us around town for all our various needs. Kingstown is a noisy, bustling, chaotic place and we could appreciate why it would have been so difficult to do our own clearance here. Every shop has a guard at the entrance, giving the place a rather edgy feel. Without Desmond as our chaperone, I don’t think we would have felt safe walking around town on our own. But our mission was accomplished, and after a long, long, wait in the Lime shop jostling with scores of school kids and locals, we were finally successful in getting our sim cards. At last I have an operational phone, much to the relief of all on board who’ve had to put up with my angst! We have a water-maker, but it’s so power hungry that when we make water we have to have either both engines running or the portable generator (which doesn’t make us very popular with our neighbours in the anchorage). So the deal on Toucan is everyone is allowed a ‘boat shower’ every other day. What’s a boat shower you ask? It consists of 30 seconds of wetting yourself down, turning off the water while you lather up, then another 30 seconds of rinsing off. If you can also manage to wash your undies in the water caught in the basin, so much the better! The other alternative is to jump in the water then lather up on the back deck with salt-water soap or baby shampoo (in swimmers we hasten to add – the Europeans seem to delight in showering naked off the stern of their boats, but we’ve now seen enough overweight middle-aged European bodies that we’ve vowed never to subject our neighbours to this gruesome sight!). Obviously no taps are left running while cleaning teeth, and dishes get washed once, not rinsed first, washed and rinsed again as you might do at home! A bit of a challenge at first, but everyone seems to be getting the hang of it now. Unfortunately our water-maker isn’t a ‘set and forget’ one – we have to monitor the pressure gauge every half an hour to ensure it hasn’t crept up, which means someone has to stay on the boat for the two or three hours that we make water (usually every other day). Our power comes from our batteries, charged by the engines or the portable generator, and we also have the assistance of 3 solar panels when the sun’s shining. We discovered some time ago that our portable Waeco freezer was drawing far too much power out of the batteries (and not maintaining it’s temperature) so sadly we’ve had to decommission it. Even so, in order to keep enough charge in the batteries overnight, we also have to turn off one of the two fridge compressors when we go to bed, and hope someone remembers to turn it back on again in the morning! Despite this, it’s still necessary to do some additional charging each day, usually an hour of two in the late afternoon. And whether it’s the engines or the generator, it’s using fuel… so it’s a constant juggling act! It’s a very different existence to living on land where our resources are taken for granted. But there’s something very satisfying about being self-sufficient and living ‘off the grid’ – even if it does require some sacrifices. All we have to do now is wean everyone off their internet and coffee addictions! The other adjustment to living on Toucan is getting used to the ‘dance of the hatches’. 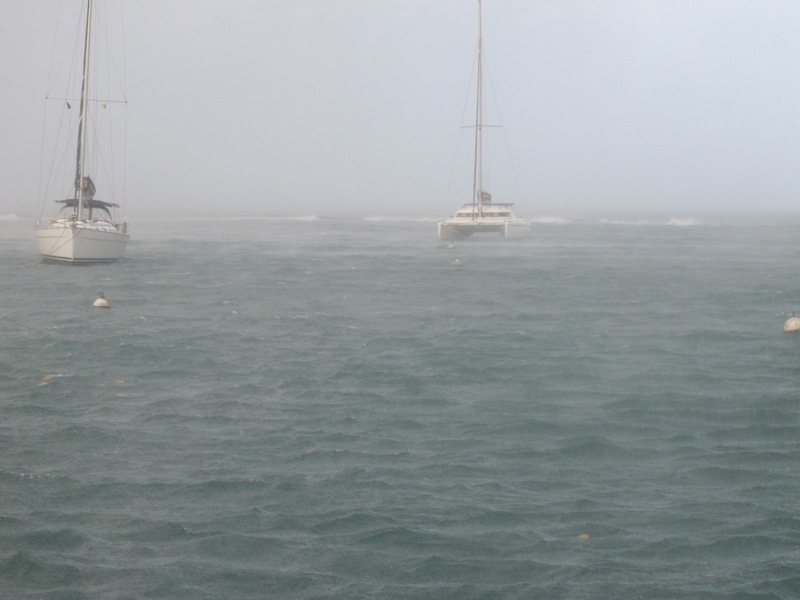 Since being in the Caribbean we’ve got used to the frequent rain squalls which often come with little warning, and mostly in the middle of the night. It’s a rude awakening if you’ve left your overhead hatch open! In the daytime when we can see them approaching there’s a mad dash to close all the hatches, then we open them, close them, open them, close them, do the hokey-pokey and turn around, and do it all again! Tomorrow we leave St Vincent and head further south into the Grenadines. First stop Bequia, which by all accounts is a favourite yachtie hangout. Can’t wait!